“Damn, another one,” muttered a candidate who shall remain anonymous, attending yet another mayoral forum shortly before the April 1 primary. A calendar-crushing series of debates and forums is now an expected part of local Washington campaigns. But there are signs our upcoming general election may break this pattern. This campaign, we may not have any significant forums until after Sept. 8! We’ll explain below. The record number (no one really keeps count) may have been set back in 1998, with more than 100 forums. 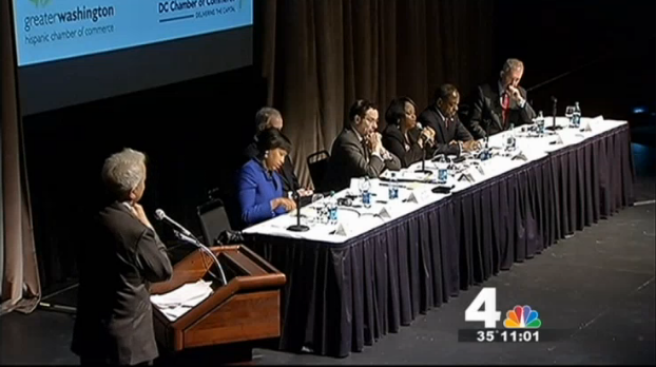 In this year’s Democratic primary, both Mayor Vincent Gray and eventual winner Muriel Bowser, the Ward 4 D.C. Council member, strategically attended or didn’t attend forums based on whether they fit their politics or their schedules. Meanwhile, the also-rans in the eight-person field raced to attend nearly every one possible. But will Bowser, the early favorite in the November general election, embrace — or maybe barely tolerate or just plain ignore — forums that even now are being planned? There is speculation that Bowser will attempt to marginalize at-large Council member David Catania, who is running as an independent. One way Bowser can undercut Catania is by avoiding joint appearances with him. One education group says it has already been informed that Bowser will plan such appearances only after candidates are certified for the November ballot. That’s a long time off, folks. According to the Board of Elections, petitions for the general election won’t be distributed until June 13. Candidates will have until Aug. 6 to turn them in with signatures. Then, there is a required 10-day challenge period through Aug. 18. The elections board told us that the board won’t certify names on the November ballot until at least Sept. 8 — and that’s barring any unexpected delays. That means we could go through five months of this seven-month campaign without community forums that many of you are expecting to hold. And that means Bowser could go the whole summer avoiding forums on a self-imposed technicality. On last Friday’s “Politics Hour” on WAMU 88.5, before we knew the ballot wouldn’t be firmed up until Sept. 8, we directly raised the forum issue with Bowser. “Can we anticipate that you’ll go through this grueling list of forums that we normally have in a campaign? Or will you try to run outside of those forums?” we asked. That’s a reference to early polls showing Bowser ahead of Catania by 20 percent or more. But we have a seven-month campaign ahead of us. We noted on the “Politics Hour” that city residents already are deep into discussions about education reform, including looming boundary changes and questions of per-pupil funding. They’re all central in the upcoming campaign, as well as whether Chancellor Kaya Henderson would stay in her post under either Catania or Bowser. And, we noted, Catania has visited more than 130 schools as council education chair and is making education his focus. Don’t the voters deserve a clear discussion of all of this? Bowser, who like Catania has committed only to considering keeping Henderson, agreed that education policy is a central issue in this campaign. So, we tried again. Bowser clearly wasn’t embracing the forums. It’s worth noting that the turnout for the primary — 22.5 percent, without accounting for absentee or special ballots — was a 30-year low. So, to all the community, education, media, business, labor and assorted other groups out there, you’d better get those forum requests in quick. We have a feeling this seven-month campaign may not have much room or time for you.